Home to all four types of volcanoes. Lassen Volcanic National Park is rare in that all four types of volcanos can be found here. Lassen Peak, inside the park, is the southern-most volcano in the Cascade Range and the largest plug dome volcano in the world. The area around Lassen Peak has mud pots, fumaroles and hot springs. President Theodore Roosevelt originally declared Lassen Creek and Cinder Cone as national monuments in 1907. These National Monuments and the surrounding areas were declared a National Park in 1916 in part due to volcanic activity in the area from 1914 until 1921. One of the world’s largest plug dome volcanoes sits on the remains of Mount Tehama, a stratovolcano that either collapsed into a caldera or eroded and was carried away by glaciers. Until Mount St. Helen’s exploded, Lasen’s eruption was the most recent volcanic explosion in the lower 48 states. There are 14 permanent snowfields on Lassen Peak. Lake Helen, south of Lassen Peak, is one of the snowiest places in California. Brokeoff Mountain, the second highest peak in the park, is also on the remnant of Mount Tehama – on the other side of the caldera from Lassen Peak. There are several geothermal areas in the caldera and three other mountain peaks around the caldera. The Main Park Road is the highest road in the Cascade Mountains. Up to 40 feet of snow can accumulate on the road and patches of snow can remain into July. The road is generally closed from late October to early June. There are more than 150 miles of trails in the national park. The Bumpass Hell trail explores Lassen’s largest hydrothermal area. This is a 2.6 mile roundtrip hike of moderate difficulty that takes 2 hours. The trailhead is six miles from the southwest entrance and is often full on weekends and holidays. There are eight campgrounds in the park. 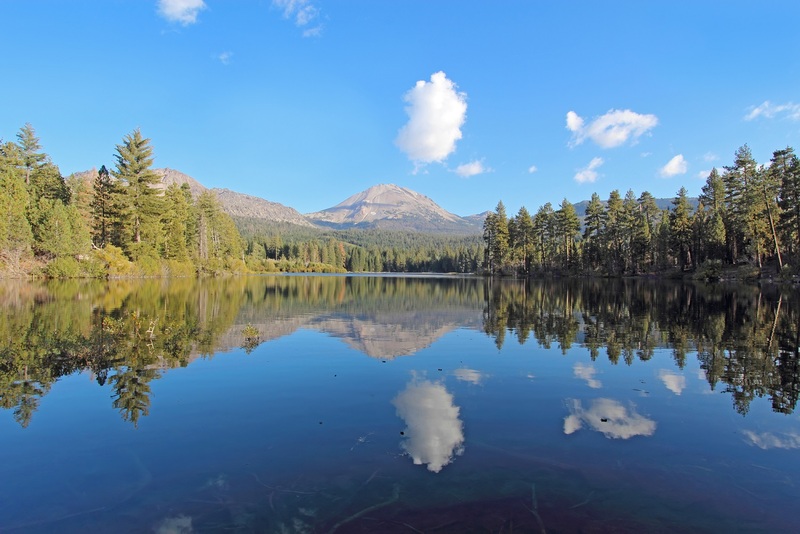 Manzanita Lake Camground and Butte Lake Campground both have more than 100 sites. Four campgrounds offer first come first served sites. Both Manzanita Lake and Butte Lake take reservations. There are 20 rustic cabins on the north side of Manzanita Lake Campgroumd near Manzanita Lake. Reservations can be made online for these units up to six months in advance. Drakesbad Guest Ranch offers 19 lodge and bungalow units on the southeast end of the national park. Nestled in glacier carved Warner Valley, it offers a rustic retreat to overnight guests and day visitors. It is open for guests from early June to early October.